It makes the world go around, it talks, it can't buy happiness, and the only sure way to double it is to fold it over once and put it in your pocket. Yes, we're talking a mark, a yen, a buck, or a pound, but minus that clinking, clanking sound. In other words, currency. While vintage coin collections are a dime a dozen, it is more unusual, and more difficult, to accumulate historical paper money. Almost as quickly as they disappear from the average checking account, banknotes become victims of the wear and tear of circulation. The average life span of a one dollar bill is 22 months according to the Federal Reserve Bank. By contrast, the average coin stays in circulation for 25 years. 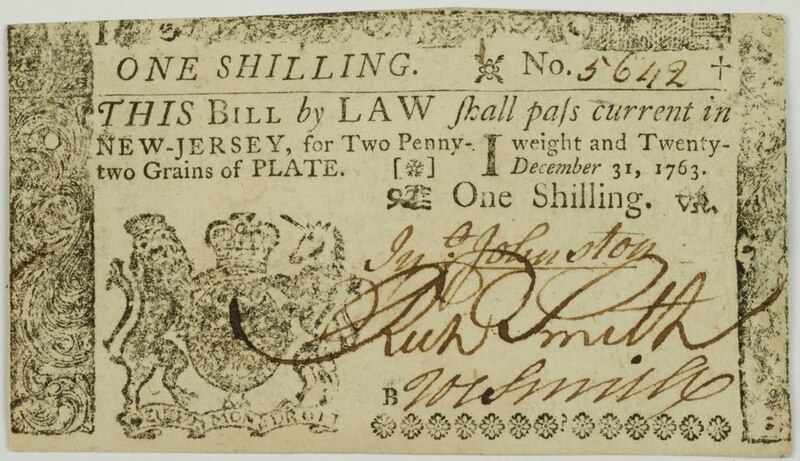 But the design and creation of printed bills dates all the way back to 7th century China, and a new exhibition of archival currency at Princeton University's Firestone Library proves making money really can be a fine art. This Beautiful Note Has Since Been Replaced By The Euro. The exhibit, Money on Paper, features American currency from Princeton's Numismatic Collection, one of only three such comprehensive collections at a U.S. university. (The others are at Yale University and the University of North Carolina at Chapel Hill.) 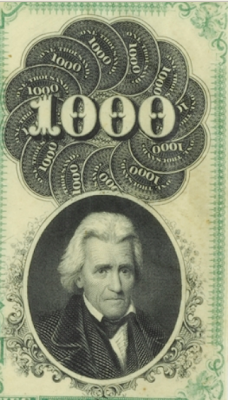 Princeton's currency collection includes over 650 U.S. Colonial/Continental notes, roughly 2,000 Confederate States of America bills, and nearly 1,200 19th century American "Broken Bank Notes," so named because of the frequency with which the issuing banks closed up shop, leaving the bill holder with a fistful of worthless paper. Supplementing the display are rare items on loan from the world class banknote collection of Princeton Class of 1983 alum, Vsevolod Onyshkevych, which is particularly strong in European currency. Beginning in 1684, British colonies were barred from minting their own coins. 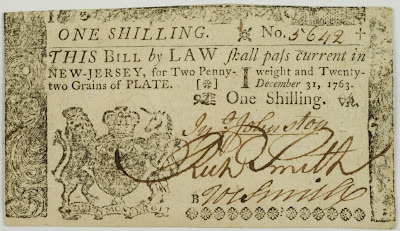 This led to the American colonies becoming one of the earliest regular issuers of paper money. Both Paul Revere and South Carolina engraver Thomas Corum were notable designers of colonial currency, but the most inventive note printer of the era was, not surprisingly, Benjamin Franklin, who even penned a 1729 treatise on the subject. Beginning in 1730, Franklin was the printer of all paper money issued by Pennsylvania, New Jersey, and Delaware. Franklin's license to print money proved extremely lucrative, and he devised several ingenious ways to prevent counterfeiting. 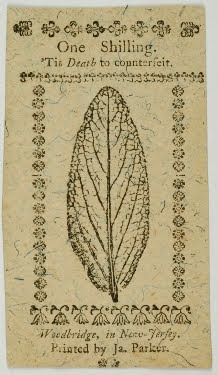 These included a secret process for transferring the irregular patterns and fine lines of tree leaves onto printing plates, and the creation of a unique paper stock infused with mica particles. The star attraction of the Princeton exhibit is the first public display of what has been called the "holy grail of Audubon scholarship," the recently discovered banknote engraving of a grouse by the great wildlife illustrator, which is his first published work. Audubon had made two references to the illustration in his diaries, but some researchers doubted its existence. It was even suggested that Audubon lied when he wrote of it to enhance his, then nonexistent, reputation. 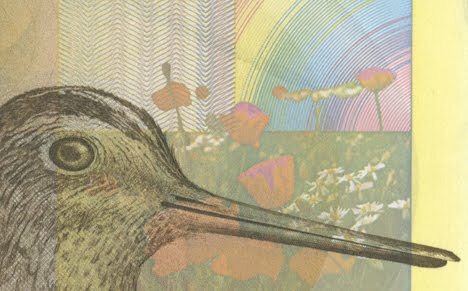 Eric Newman, a numismatic historian, and Robert Peck, a senior fellow with Philadelphia's Academy of Natural Sciences spent ten years searching for the long-lost illustration. They discovered it on a sheet of sample images produced in 1824 by a New Jersey engraver who specialized in illustrations for banknotes. Although it is unsigned, the image is "Vintage, quintessential Audubon," according to Roberta Olson, curator of drawings at the New York Historical Society, which houses all 435 original watercolors for Birds of America. 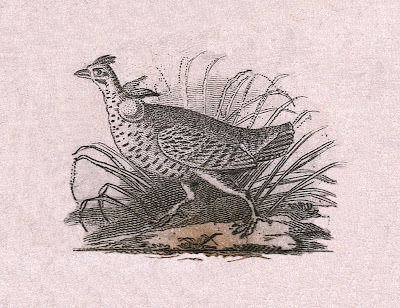 On display with a sample sheet containing the vignette will be an original watercolor by Audubon, a steel printing plate from Birds of America, and the Princeton first edition of the elephant folio book open to the page with Audubon's drawing of the pinnated grouse. Who Knew George Had Such Great Gams? and the Mythological Figure Hebe by Asher B. Durand. Issued A Five Featuring This Scantily-Clad Beauty? One of the premier banknote designers of the first half of the 19th century was renowned Hudson River School painter, Asher B. Durand. 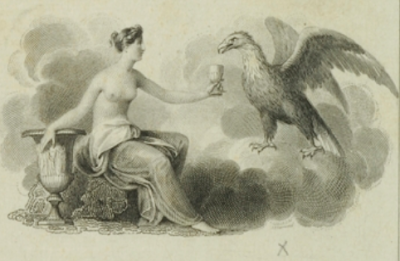 Durand began his career as an engraver. He produced the well-known engraving of the signing of the Declaration of Independence for portraitist John Trumbull, which in 1995 became the obverse design on the two-dollar bill. Durand, along with his brother, Cyrus, pioneered the classical, patriotic designs which still hold sway over American currency today. Their intricate borders and highly detailed designs were also a delightfully decorative way of discouraging would-be forgers. 7th Vice President Of The United States. Montgomery, Alabama, May 22, 1861. 7th President Of The United States. Another section of the exhibit compares the imagery of Northern and Southern currency before and during the American Civil War. 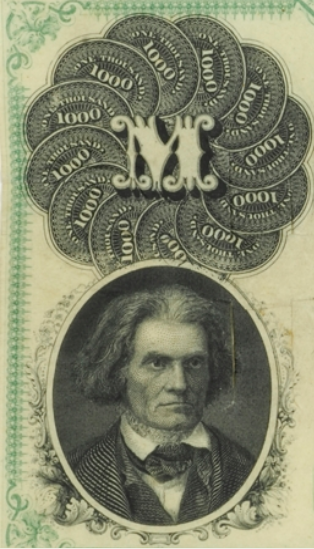 Included is a complete set of six notes printed by the National Bank Note Company of New York and smuggled into the Confederacy in 1861 for distribution as currency of Alabama and Virginia. These notes are in Extremely Fine condition, making them exceedingly rare. "Electricity as the Dominant Force in the World." And The Image That Got It Banned In Boston. 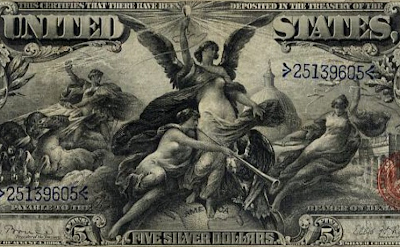 The American section of the exhibition ends with the Educational Series of 1896, a group of Silver Certificates featuring allegorical motifs, and considered to be the most beautiful currency ever produced in the United States. Designed and engraved by some of the most important illustrators of the day, the series featured the infamous five-dollar bill "banned in Boston" due to its depiction of bare-breasted women on the obverse. 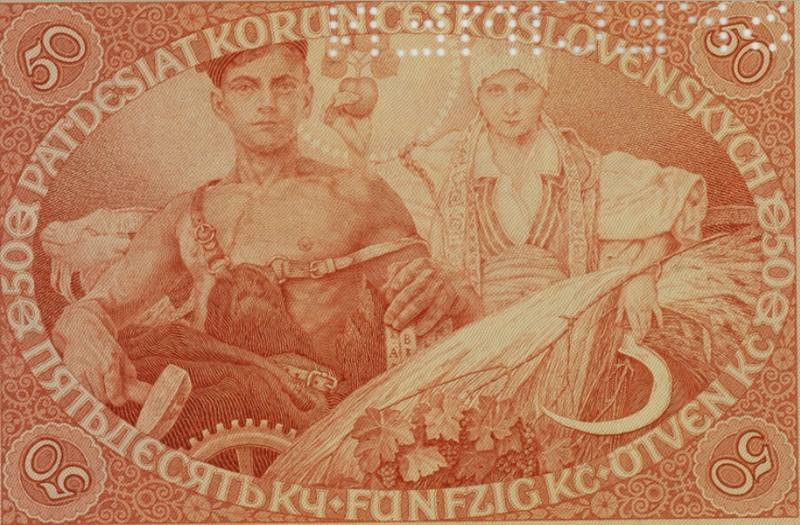 The European section of the show includes Czechoslovakian currency produced by Alfons Mucha, better known for his Art Nouveau posters of actress Sarah Bernhardt, among others. 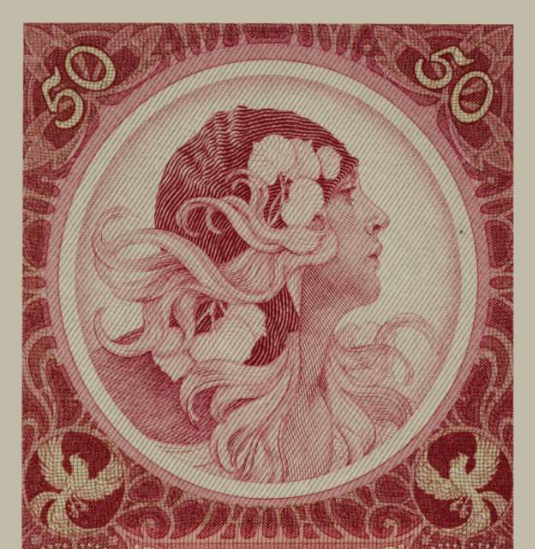 When Czechoslovakia won its independence after World War I, Mucha designed the first postage stamps, banknotes and other government documents for the new state. By the late 1930's Mucha's art, and his Czech nationalism,were denounced in the Nazi press. When German troops invaded Czechoslovakia in the spring of 1939, the 79 year-old artist was considered so dangerous he was among the first persons detained by the Gestapo. During his imprisonment and interrogation, Mucha contracted pneumonia. Though eventually released, his health was ruined, and he never recovered. Broken-hearted at the takeover of his homeland by Hitler, Mucha died on July 14, 1939. Money Featuring A Beefcake Shot. A publication entitled Money on Paper, by Princeton's Curator of Numismatics Alan M. Stahl, accompanies the exhibit. It contains a full catalogue of the bank notes on display, with many illustrated in full color. There are also three illustrated essays in the catalogue: Mark Tomasko writing on "Bank Note Engraving in the United States," Francis Musella on "Benjamin Franklin's Nature Printing on Bank Notes," and an edited version of the headline-making article by Robert Peck and Eric P. Newman entitled "Discovered! 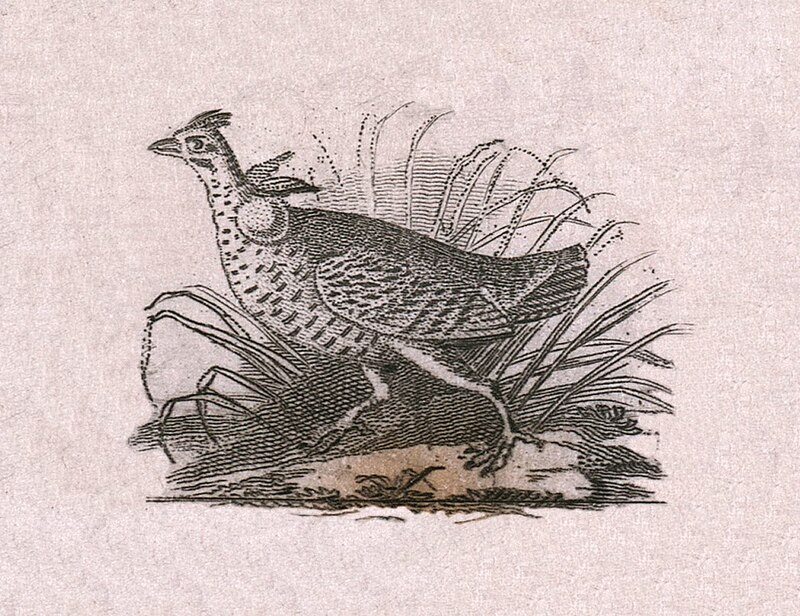 The First Engraving of an Audubon Bird." The Money on Paper exhibit at the Leonard L. Milberg Gallery for the Graphic Arts of the Firestone Library opens August 30, 2010 and continues through January 2, 2011.